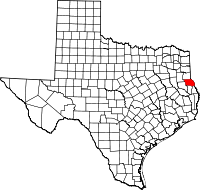 Shelby County is a county located in the far eastern portion of the U.S. state of Texas. As of the 2010 census, its population was 25,448. Its county seat is Center. The county was created in 1835 as a municipality of Mexico and organized as a county in 1837. It is named for Isaac Shelby, a soldier in the American Revolution who became the first governor of Kentucky. Shelby County was formerly represented in the Texas House of Representatives by the Center businessman and conservative Republican Wayne Christian. In 2012, Christian was defeated for renomination by current Representative Chris Paddie. Shelby County was formed in 1837. It was named for Isaac Shelby, a soldier from Tennessee during the American Revolution, and first Governor of Kentucky. According to the U.S. Census Bureau, the county has a total area of 835 square miles (2,160 km2), of which 796 square miles (2,060 km2) is land and 39 square miles (100 km2) (4.7%) is water. As of the census of 2000, there were 25,224 people, 9,595 households, and 6,908 families residing in the county. The population density was 32 people per square mile (12/km²). There were 11,955 housing units at an average density of 15 per square mile (6/km²). The racial makeup of the county was 72.65% White, 19.44% Black or African American, 0.36% Native American, 0.23% Asian, 0.02% Pacific Islander, 5.87% from other races, and 1.44% from two or more races. 9.87% of the population were Hispanic or Latino of any race. There were 9,595 households out of which 32.40% had children under the age of 18 living with them, 55.10% were married couples living together, 12.90% had a female householder with no husband present, and 28.00% were non-families. 25.40% of all households were made up of individuals and 13.60% had someone living alone who was 65 years of age or older. The average household size was 2.59 and the average family size was 3.08. In the county, the population was spread out with 26.60% under the age of 18, 8.80% from 18 to 24, 25.80% from 25 to 44, 22.20% from 45 to 64, and 16.60% who were 65 years of age or older. The median age was 37 years. For every 100 females there were 92.40 males. For every 100 females age 18 and over, there were 89.20 males. The median income for a household in the county was $29,112, and the median income for a family was $34,021. Males had a median income of $26,501 versus $20,280 for females. The per capita income for the county was $15,186. About 14.90% of families and 19.40% of the population were below the poverty line, including 24.70% of those under age 18 and 16.90% of those age 65 or over. The Light and Champion, a news and information company, marked its 140th year of operation in 2017. It serves Shelby County, as well as Logansport, Louisiana. The Light and Champion produces a weekly print edition, a weekly free-distribution print product called The Merchandiser, operates a web site, www.lightandchampion.com, and a Facebook page. The Light and Champion is owned by Moser Community Media, based in Brenham, Texas. Interstate 69 is currently under construction and will follow the current route of U.S. 59 in most places west of Tenaha. Interstate 369 is currently under construction and will follow the current route of U.S. 59 in most places north of Tenaha. Interstate 69 is currently under construction and will follow the current route of U.S. 84 in most places east of Tenaha to the Louisiana state line. US 59 goes through Shelby County. It is planned to be upgraded to interstate standards as part of the planned Interstate 69 up to Tenaha, where the planned Interstate 369 will follow US 59 northward to both Interstate 30 and Interstate 49 in Texarkana. US 84 is planned to be upgraded to interstate standards as part of the planned Interstate 69 from Tenaha to the Louisiana state line. Greyhound Lines operates the Center Station at the Shelby County's Best Yogurt store in Center. ^ "Shelby County". Texas Almanac. Texas State Historical Association. Retrieved June 23, 2015. ^ " "Archived copy". Archived from the original on 2012-08-15. Retrieved 2012-07-30. CS1 maint: Archived copy as title (link)." Greyhound Lines. Retrieved on July 29, 2012. NOTE: The information for Center appears as a pop-up window. ^ JR., HARPER, CECIL, (2010-06-15). "PATROON, TX". tshaonline.org. Retrieved 2018-07-30.